One day, not too long ago, I was looking at some framed pictures and a few shadowboxes that were stacked on a shelf in my closet. They had just been sitting there for months because I couldn't figure out where I wanted to hang them. I was so tired of having them take up so much space, and luckily, inspiration struck and I finally knew where I wanted to hang them! 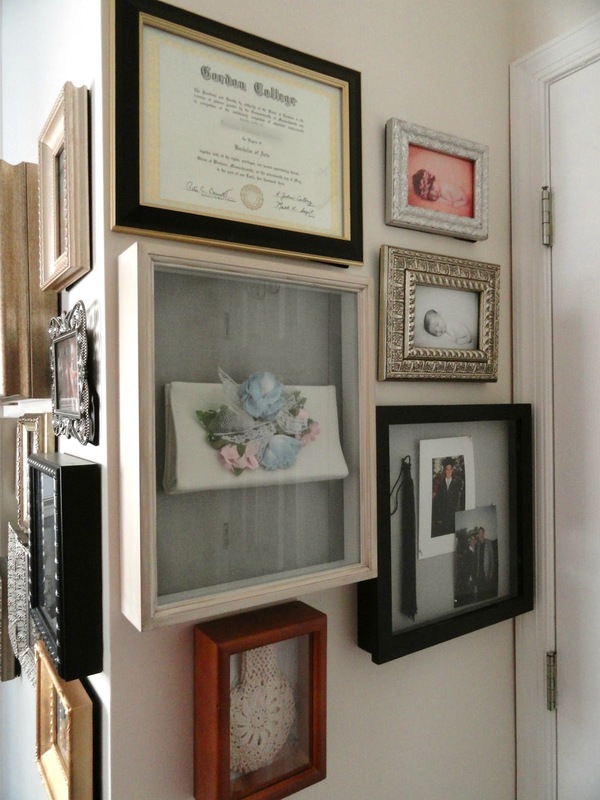 I forgot to take a before picture, but previously, the only thing on either of these walls was the shadowbox with my preserved wedding bouquet in it. If you're wondering, the door on the left is our bathroom and the other door leads out into the hallway. 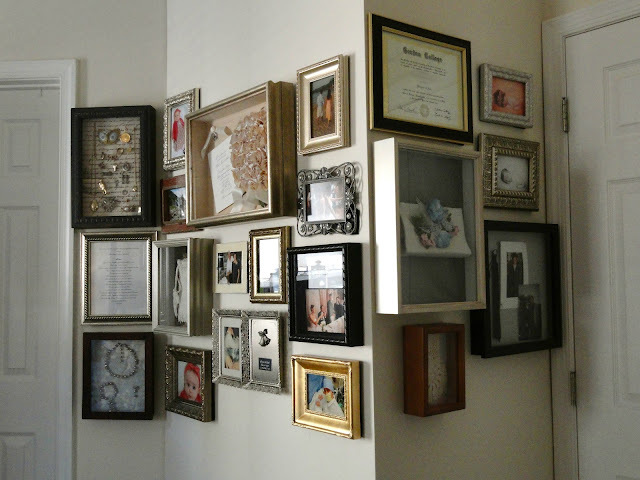 I did buy a few extra frames to fill up space on the walls, as well as a few additional shadowboxes to display more keepsakes that I had stored in boxes. I figured there was not much sense in having all of my keepsakes hidden away where I couldn't even enjoy them, and this wall seemed like the perfect place to put them on display! On the left is a sweet note my youngest sister, Cori, wrote to me one Christmas. Above and below that are several sentimental pieces of jewelry handed down to me by different family members. The white purse was my great grandmothers, used on her wedding day. Josh's college diploma and more purses from my great aunt and great grandmother. 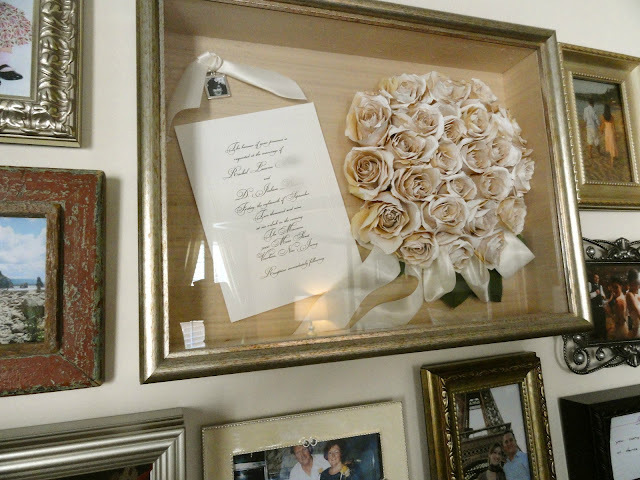 My preserved wedding bouquet and wedding invitation. 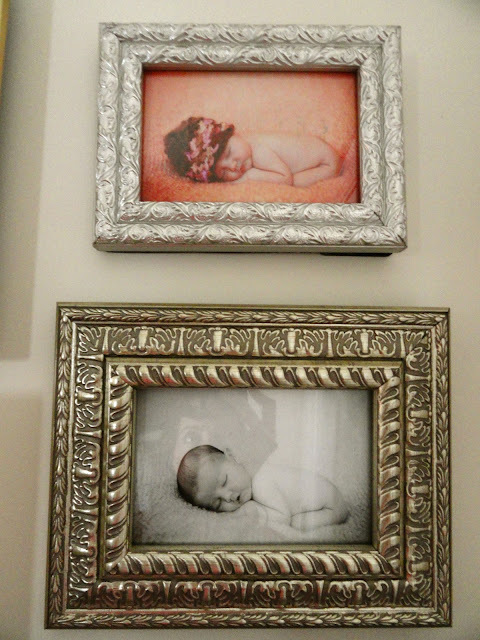 In the silver frame are pictures from my mom and dad's wedding day. I may switch out a few of the pictures inside the frames, but overall I'm really happy with the way it looks right now! I think there's even room to add a few more frames to the wall if I want to in the future. 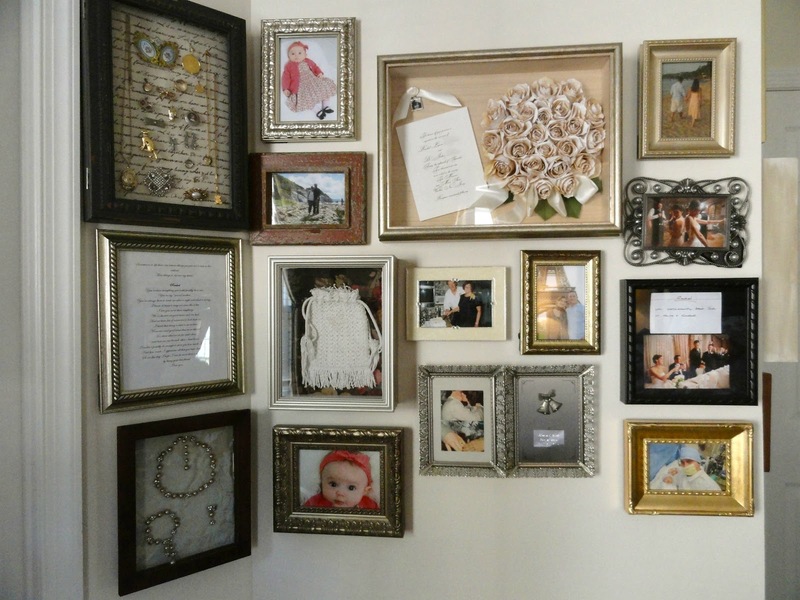 I love looking at all of my keepsakes and special pictures now! 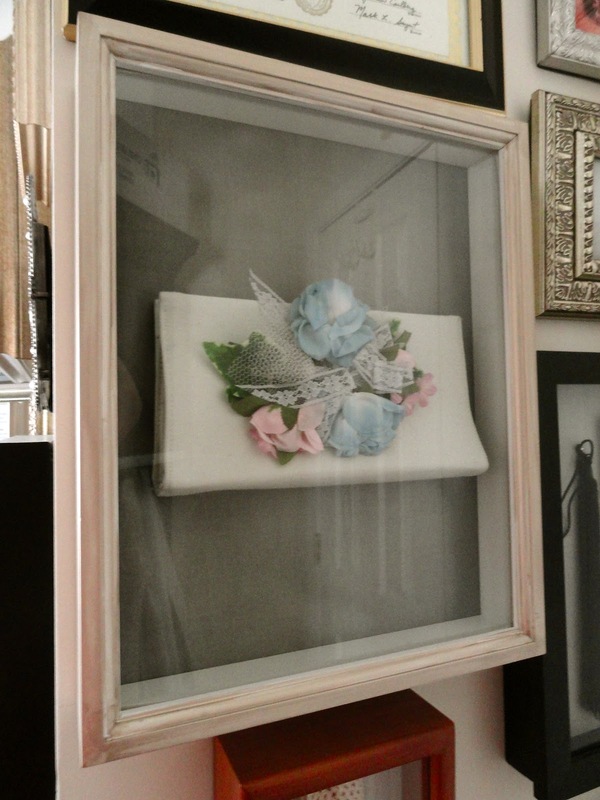 Next, I'm working on a post to show you detailed pictures of the jewelry and the purse shadowboxes with tips on how I assembled them. 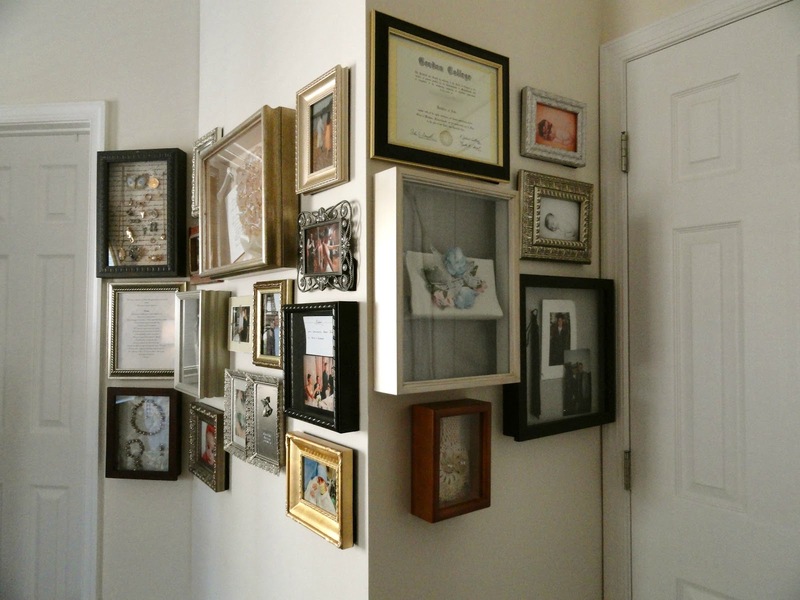 I love this gallery wall especially the shadow boxes. I hadn't thought of putting my wedding bouquet out for display in a shadow box, but now I may think of doing this! Thanks for the great ideas. Just found your blog. I am now following you and subscribing to your posts. will you return the love? Also, what is the name of the grey paint in your living room? The gray paint is Benjamin Moore's Galveston Gray.